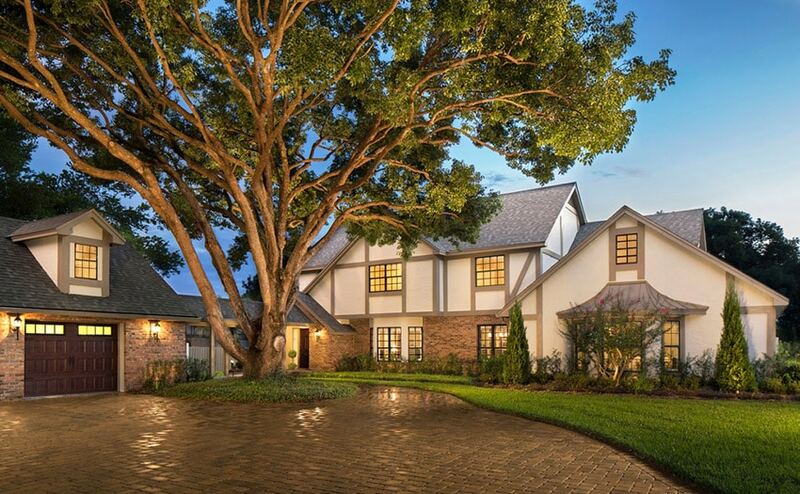 This Tudor style house design features 5 bedrooms and 6 bathrooms with a square footage of 4,526 of living space. 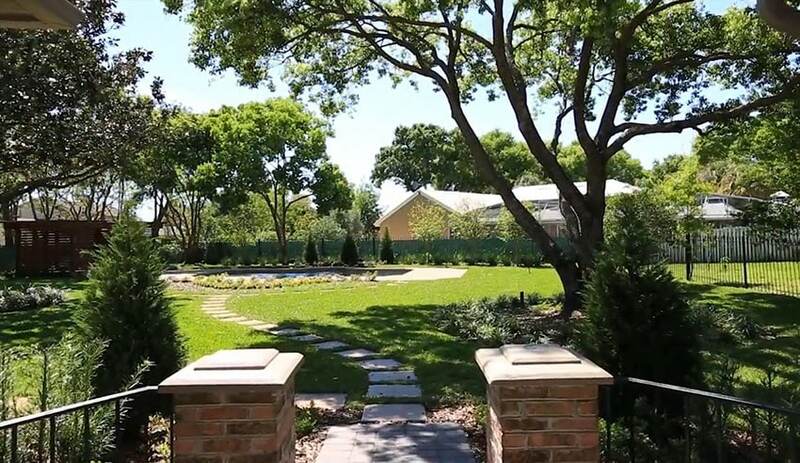 The home sits on a 1/2 acre parcel with a circular paver driveway and beautifully landscaped front and backyard. In the backyard a sparkling blue swimming pool and cabana offer a relaxing retreat and great spot to enjoy this attractive home. 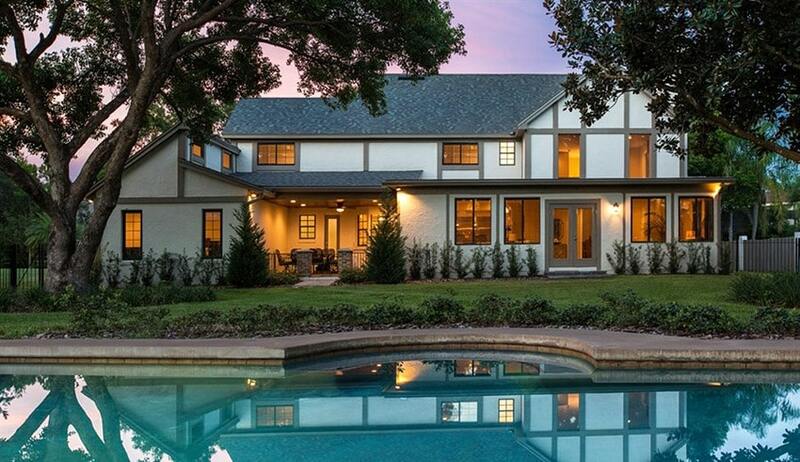 The Tudor style house design is also known as Tudor Revival and is modeled after an English cottage. Loaded with charm and personality a Tudor style home offers decorative wood beams & siding, clipped gables, diamond paned windows and impressive arched design. Common materials used in the construction of these homes are brick, stone and stucco with half timbering. Reminiscent of medieval architecture the Tudor style is popular not only in England but in the U.S and Europe. 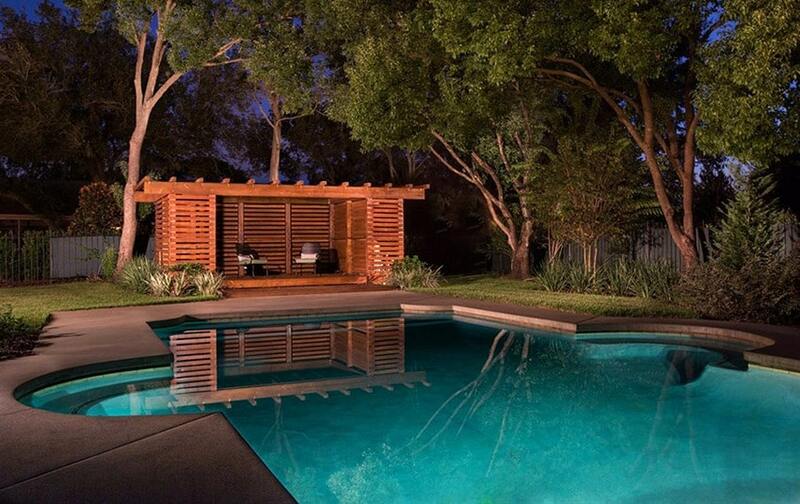 A view of the swimming pool in the home’s backyard. The Tudor style of the home is evident in the timber siding, upper level small paned windows, and arched architecture. From the foyer entryway of the home one can appreciate the beautiful acacia wood flooring and wrought iron staircase. A small closet and home office lay immediately off the front entry. 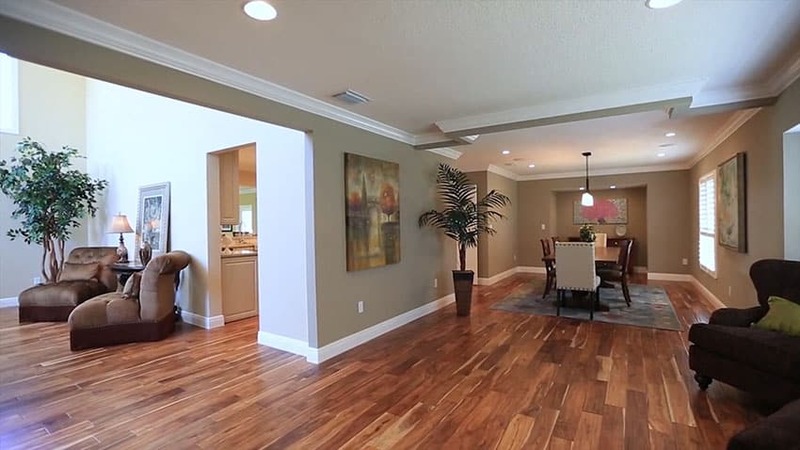 This perspective shows the entry way flowing in to the formal living room. 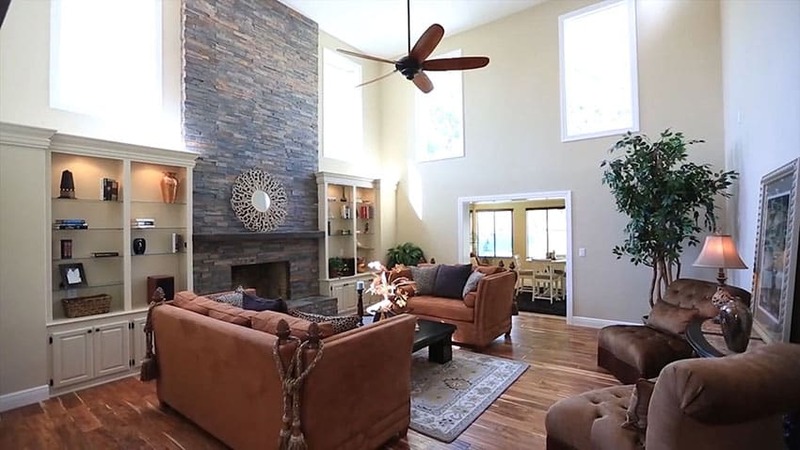 High ceilings and crown molding looks attractive and inviting. 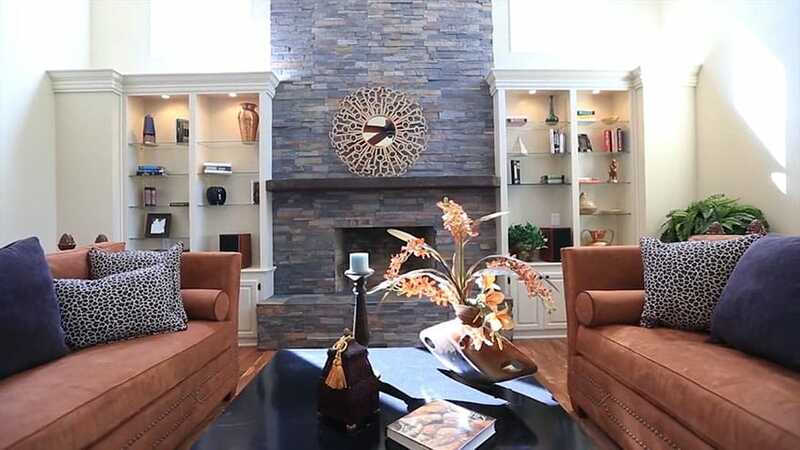 The well furnished formal living room invites guests with a a stacked stone fireplace, high ceilings and detailed crown molding. The acacia wood floors continue to flow through the house while plenty of natural light gives this room a soothing vibe. A sitting view of the living room with its contemporary decor and built-in bookshelves. 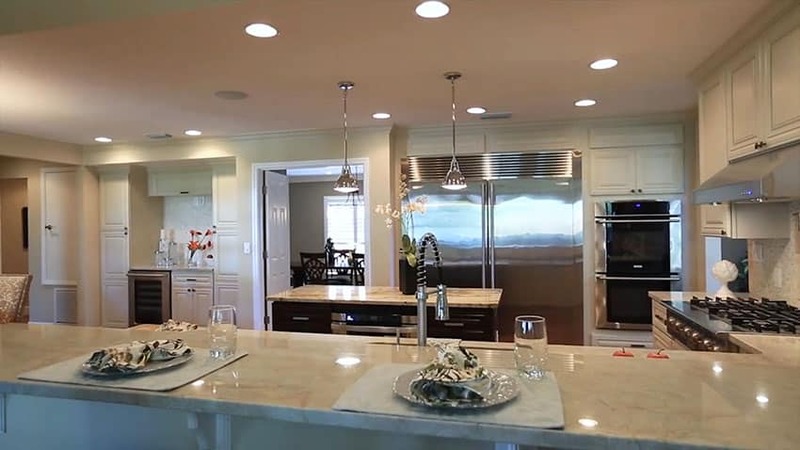 The open concept gourmet kitchen features white cabinetry with a dark island. Luxury Taj Majal Quartzite countertops look beautiful and contrast perfectly against the darker color of the wood flooring. 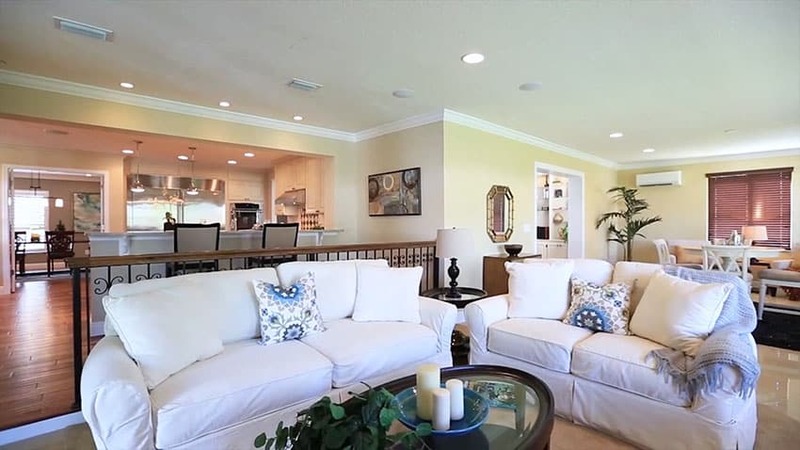 The kitchen has a long peninsula where diners can eat-in and the open layout makes it a great place for entertaining. 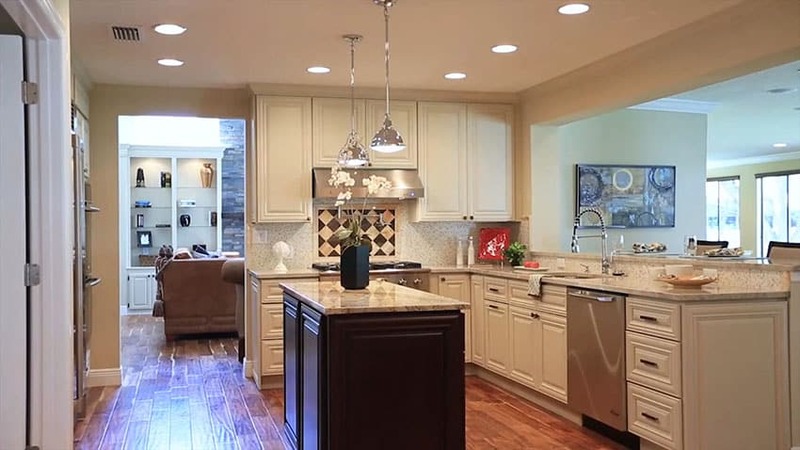 High end Electrolux appliances and a large 6 burner gas stove make this an amazing chefs kitchen. 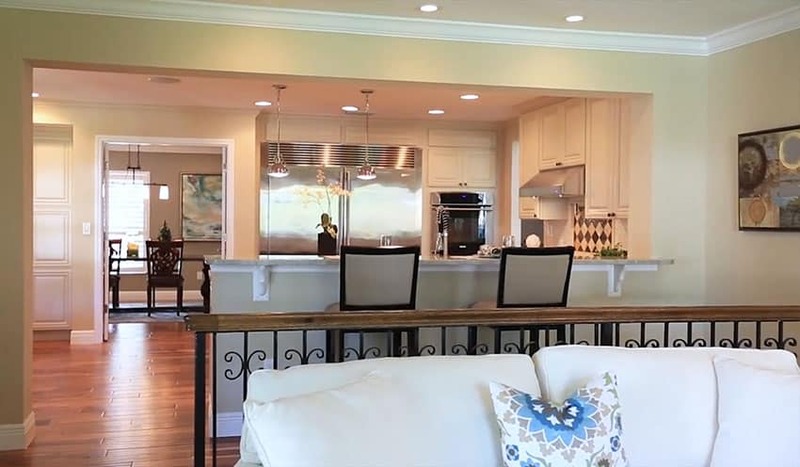 French style pendant lights and a separate bar area equipped with a wine cooler are a couple of the standout features found here. This view from the family room showcases the open plan layout with a wrought iron railing for separation from the breakfast bar. The family room just off the kitchen opens to a small informal dining area. A formal dining space can be reached through a doorway from the kitchen providing multiple spaces for dining. From this closeup view of the dining room one can see the placement of the table and chairs as well as the elegant furnishings. The master bedroom suite is located on the first floor of the home. The sage green bedroom suite provides large bay windows, double doors and lovely master bath. 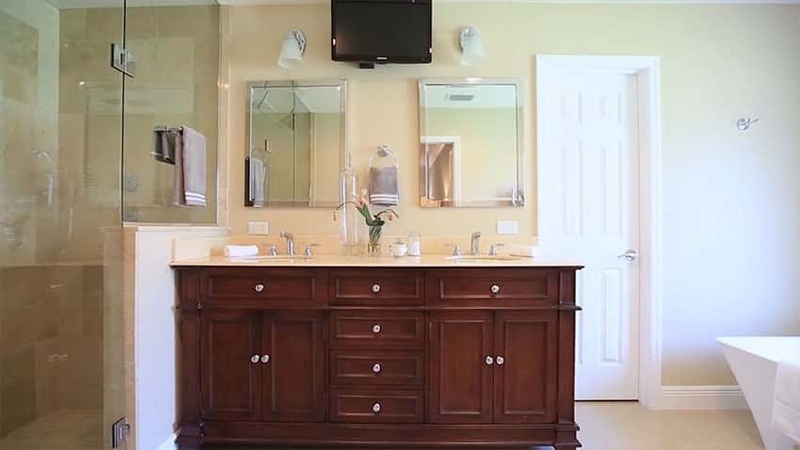 The master bath has a cherry wood double vanity sink with large glass shower and contemporary bathtub. 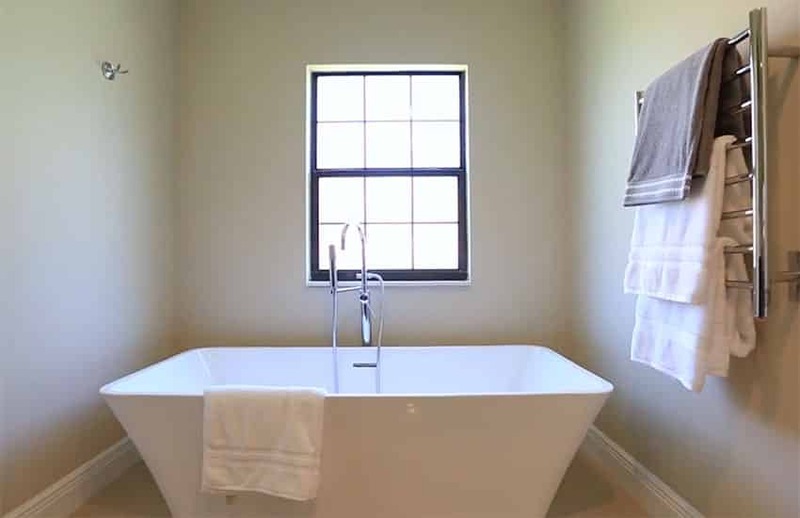 The stylish bathtub makes an inviting spot for relaxation. A Tudor style window with small panes continues the architectural style. 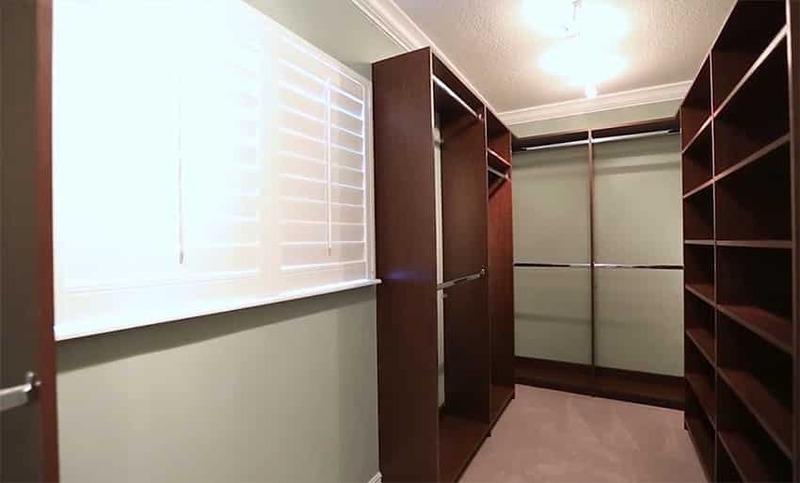 A walk-in closet with plantation shutters and plenty of shelving. 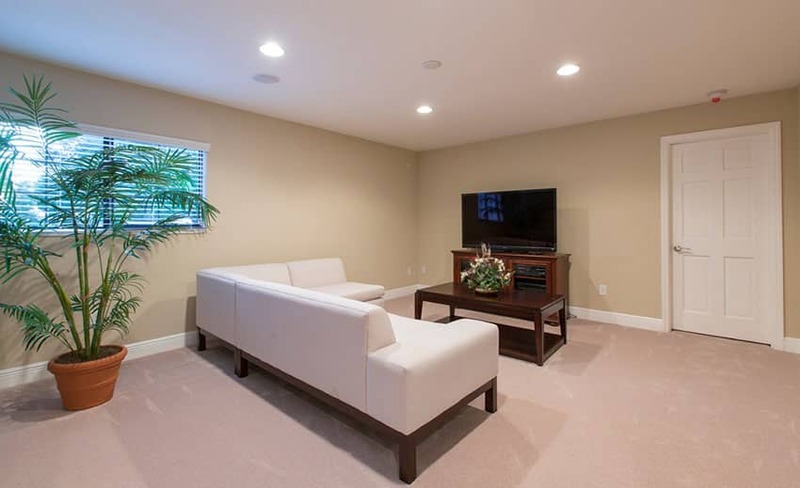 This small living room space is setup as a TV and movie room and is painted in a dark yellow. The home office sits off the front entry and has a glass paned door and large window to let in an abundance of natural light. 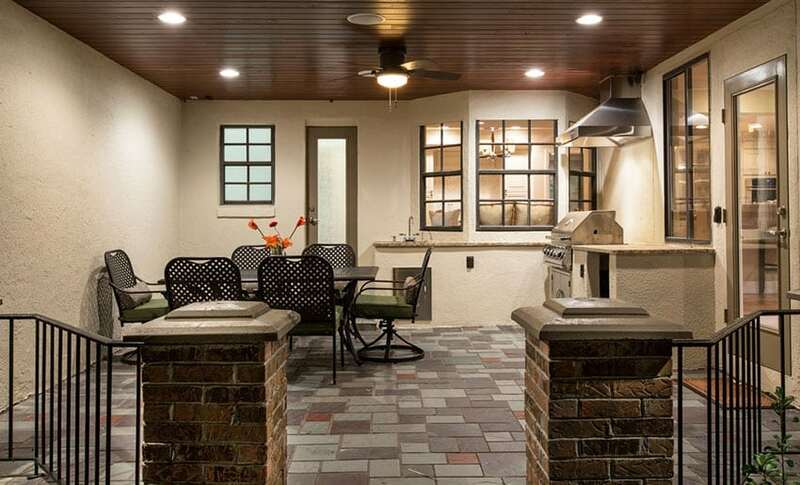 An outdoor patio with irregularly placed tiles, outdoor kitchen with range hood, and dining area make a great place for socializing and entertaining guests or enjoying family time. From the back exit of the home is a beautifully landscaped yard with brick pillars, wrought iron fences and a paver pathway that leads to the swimming pool. The sparkling pool is an inviting place for fun and relaxation. One can also enjoy the covered wood cabana. 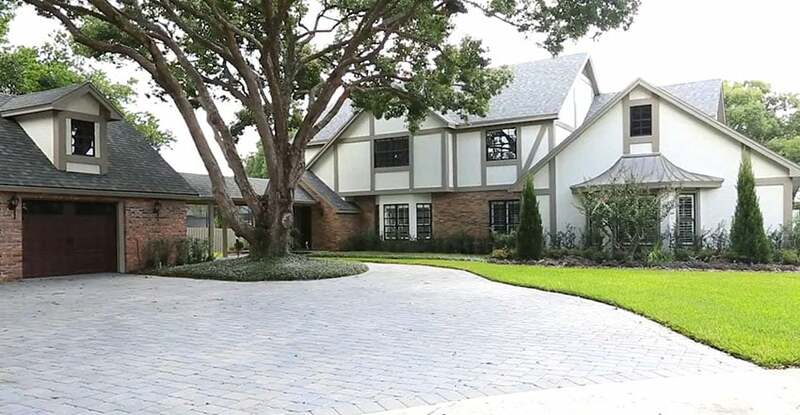 This Tudor style house design has a circular paver driveway with a detached garage and large front lawn area.